I initially thought of climbing Everest. Over 450 women have summited Everest but only 15 women have ever rowed an ocean solo. The water in my nemesis. I don’t like to be out of my depth and up until a month ago I couldn’t swim. It is a huge challenge for me. I started to research it further at the beginning of the year and initially signed up for a rowing race and then decided not to do the race any more. I wanted to go it alone. I love the idea of being at one with nature, so far from land and humanity, the isolation, the struggle and the privilege to experience something few people with ever do. I want to prove to myself that an ordinary person can do something extraordinary. I also like the idea that I can demonstrate that age is just a number, and a 60 year old woman is not past her sell by date – which is often how we are viewed by society. . 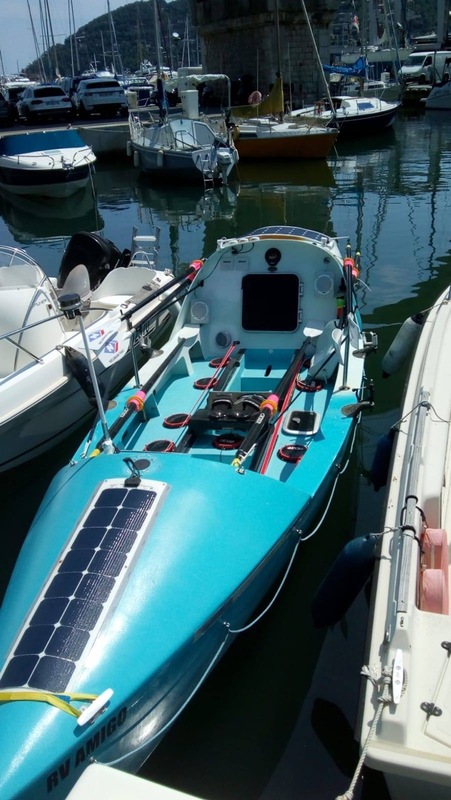 I will be going after two world records – The oldest woman to row any ocean solo and the first woman from Ireland to row any ocean solo. My crossing is a solo unsupported crossing, departing from Puerto de Mogan in Gran Canaria on the best weather window from the 17th November, arriving in St Barts. The distance is around 3,000 miles. It may take up to 90 days depending on the trade winds. I will be crossing in a Pure Class boat, which is about 7m long and 1.8 meters wide. I have equipment such as gps, plotters, auto helm, water desalinator, radios etc on board but apart from that, the facilities are basic. It’s a bucket and chuck it scenario for the bathroom. I will eat dehydrated food mixed with cold water to avoid the danger of scalding myself in high seas. This is my first monumental adventure, though I have done things like MDS, Trans 333, Guadarun, Antarctica Marathon, Verdon Trail, Yukon and of course Jungle Marathon which I organise. I took up running at the age of 42 and swapped a 60 ciggies a day habit for running long distances. Up until the beginning of August my boat, RV Amigo, was being refurbished so I only got on the water with her early August and have been training almost daily since then and will continue to do so up until I leave for Gran Canaria. Prior to that I was rowing on an ERG 4+ hours a day ( generally getting up in the middle of the night twice to do two 2 hour stints). I will have done at least 200+ hours before I leave. I have a good basic fitness. I run 10-15km a day, I water jog, I go for long hikes. Since I signed up I have been rowing on the erg, I am now swimming 75 lengths of a pool a day (I couldn’t swim a width a month ago) and I am on the water rowing for as many hours as I can. I am doing weights for some upper body strength. In terms of training I don’t think it’s different for a woman of my age. In terms of tenacity I think we have more at 60, though my creaky old back might say differently after a couple of months at sea ! I am also training for endurance and upper body strength. I have also trained in sea survival, sea first aid, navigation and seamanship, radio operator’s licence, and I also did an ocean rowing course. For me, even though the physical plays a part as long as I have a solid fitness basis the rest is mental for me. The mental drives the physical and pushes you through the pain barrier when you have blisters on your hands and feet, salt sores on your bottom, sea sickness and are fed up to the back teeth of being constantly wet and covered in salt water, terrified of the storms and cannot see land…. In terms of safety, I will have a life raft ( a 4 person one, so much bigger than my boat!! ) Immersion suits, lifejackets, EPIRB ( Emergency Position Indicating Radio beacon) – if I set this off then all ships in the ocean are informed of a Mayday situation and the nearest one will rescue me) PLB ( Personal locator beacon) that will be attached to my lifejacket so I can activate if i go overboard and cannot get back into my boat), I have my VHF radio (useless unless line of sight) and I have Leven Brown ( who has prepared my boat and has done training with me and will do my weather ) at the end of the sat phone if I have an issue on the boat with which I cannot deal myself so that he can troubleshoot. I will wear a harness and be tied on to the boat in two places at ALL times. I have three sets of oars with me and back ups for everything, eg 3 sets of sunglasses, two sat phones, two radios, hand held water maker, hand held gps, compass, ballast mineral water in case both water makers fail. My concerns are things like rogue waves. Rowing 14 hours a day. Seeing a container ship on my course that doesn’t hear me on the radio! Stray containers that have fallen off cargo ships. Sea-sickness. Capsizing- though I do know my boat self-rights. Not eating fresh fruit and vegs. That said there is so much to which to look forward, the good and the less good and the terror. It’s all part of the journey. Seeing dolphins playing by the boat, seeing whales, sharks, sea turtles, seeing the mighty waves, the physical battle of rowing 14 hours a day – my survival and most of the all, that very first ice cold rum punch when I reach St Barts! To me achievement is something that makes me feel self-full-filled. This is really a journey to test me! 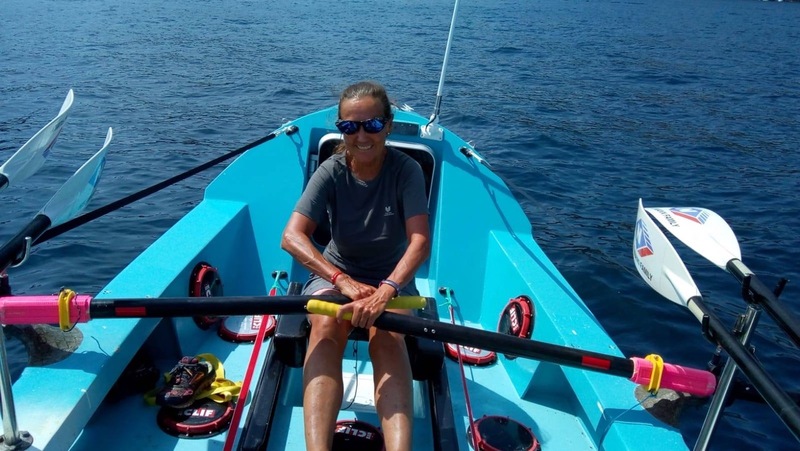 I am going for two world records- oldest woman ever to row any ocean solo and the first Irish woman to row any ocean solo. Getting those world records will be an achievement. My sense of adventure is excited about battling the unknown. September 6, 2018 in News & Current Affairs. Take me with you baby .. i am so jealous. You are brave beyond words. I will track your progress everyday. God and his helpers be with you .